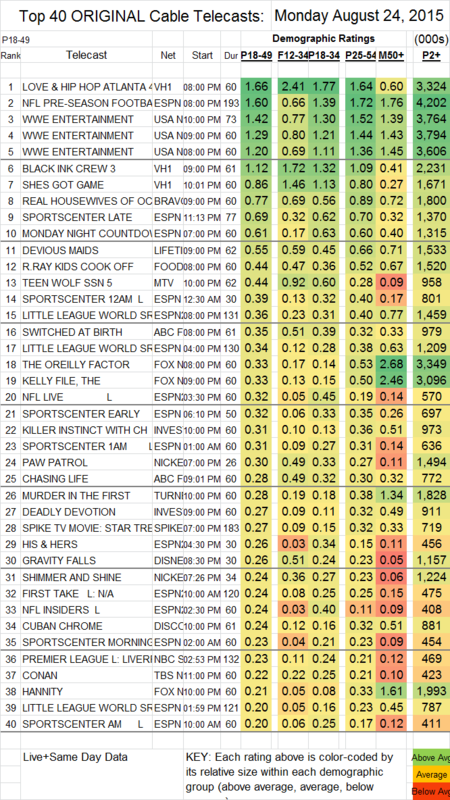 NETWORK UPDATE: The BACHELOR IN PARADISE after-show fell by 0.1 in final numbers, as did both the AMERICAN NINJA WARRIOR clip show and RUNNING WILD, as well as the NCIS: LA rerun. In addition, the entire CW line-up dropped by 0.1. CABLE HIGHLIGHTS: VH1’s LOVE & HIP HOP ATLANTA continues to be one of the strongest shows on cable, down this week by 0.05 to 1.66, and with lead-out BLACK INK CREW at 1.12 and SHE’S GOT GAME (pushed to 10PM) down 0.08 to 0.86. ESPN’s NFL PRESEASON Cincinnati vs. Tampa Bay game was at 1.60. USA’s WWE coverage was at 1.42-1.20 over its 3 hours, compared to 1.34-1.23 last week. On Bravo, REAL HOUSEWIVES OF ORANGE COUNTY dropped a tenth to 0.77. The season finale of Lifetime’s DEVIOUS MAIDS rose 0.09 to 0.55. The season finale of MURDER IN THE FIRST on TNT dropped 0.05 to 0.28. The midseason finale of MTV’s TEEN WOLF was down a hundredth to 0.44 (and in the F12-34 demo, down 0.12 to 0.92), and the WOLF WATCH post-show was at 0.19. SWITCHED AT BIRTH returned to ABCFamily at 0.35, compared to 0.52 for last week’s midseason finale of THE FOSTERS (and in F12-34s, down a startling 0.66 to 0.51), while CHASING LIFE was up a tick in 18-49s to 0.28, but down 0.05 to 0.49 in F12-34s. On Discovery, CUBAN CHROME fell 0.07 to 0.24. BIG BROTHER AFTER DARK (POP) was at 0.02/77K.